Western Boxing in one for or another has been around for a long time and there’s evidence of it going back to over 3500-4000 years, with depictions/descriptions of it from Iraq, Crete and Egypt. It has also been a sport as far back as 700 BC and was an Olympic sport as early a 688BC. There was much development and promotion of the sport in Britain from the 16th century on, which was also known as prize fighting during it’s earlier development. Modern boxing is now a well known and heavilay regulated sport. Training for Western Boxing can enhance and improve strength, endurance/conditioning, speed, agility, stamina, flexibility and reflexes. Boxing training can consists of learning how to move and place your feet, how and where to hold your hands/arms, defensive moves/positioning (slipping, bobbing, blocking, covering up, clinching, footwork and evasion), punches (jabs, crosses, counter strikes, hooks, uppercuts, straight punches) and any combination/variation of these and a few others that aren’t specific or just happen to happen at the time. Western Boxing is a great total body workout as well as a very practical martial art. Students will learn real boxing techniques from coaches that have trained top-level professional fighters. Ground Control’s boxing program differs from most “boxing classes” because the student will learn the proper techniques rather than just throwing improper punches at a heavy bag while being yelled at to go for the entire class. The student learns real techniques while getting an exceptional workout. 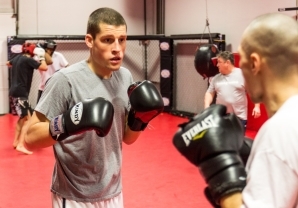 We recommend you arrive 15 minutes before schedule, as the boxing class will start on time. The instructor will have a precise plan for the class. While the techniques will change, the class routine is always similar so you know exactly what to expect during each part of practice. Students with more experience are always there to help new members get started.